The heart is a myogenic pump which means it is responsible for its own stimulation to pump blood out to the rest of the body. However, to do this blood must be efficiently returned to the heart so that it can be pumped around again in the next cycle. Venous return is therefore important in maintaining normal circulation and this article will discuss those factors which influence venous return. Rate the blood enters the veins – this is linked to the peripheral resistance in the body. When resistance is high, there is a slower rate of blood entering the veins, which will decrease venous pressure. When resistance is low, there is a faster rate of blood entering the veins, which will increase venous pressure. Rate the heart pumps blood out – this is linked to the cardiac output of the heart. When cardiac output is rises, blood is rapidly pumped out of veins, which reduces venous pressure (as it doesn’t get a chance to rise). When cardiac output falls, blood is slowly pumped out of veins, which raises venous pressure. The filling pressure of the heart is called the central venous pressure. Under normal circumstances this ranges from 2-6mmHg. It is responsible for filling the right atrium during ventricular systole. Veins are low pressure, low resistance vessels. They have a high capacitance, which means that they can distend with increasing pressure of blood, allowing them to carry more blood. Veins have valves which act to maintain the unidirectional flow of blood. The competency of these valves is important in maintaining venous return as it ensures blood is always flowing towards the heart. 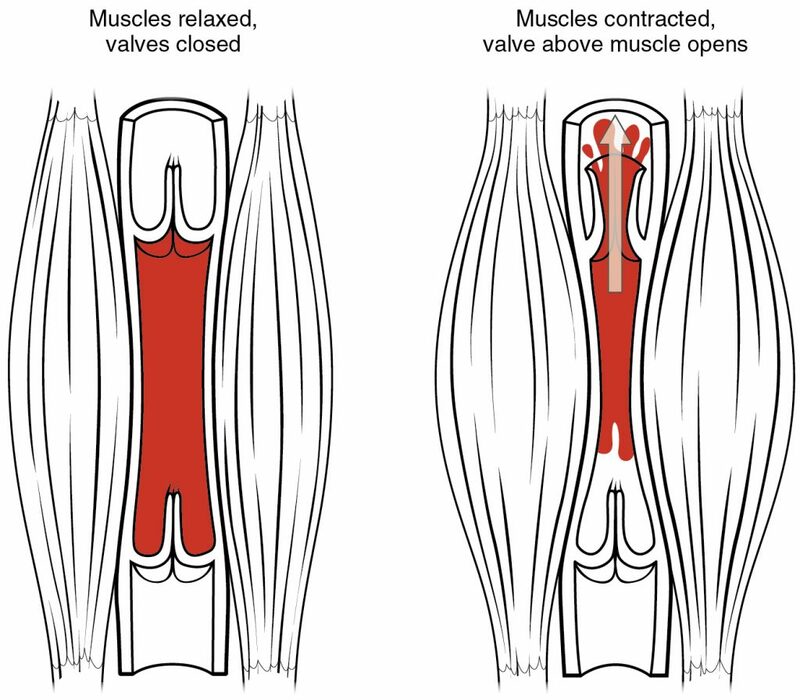 Skeletal Muscle Pump – Peripheral veins work in concert with the muscular contraction to increase venous return to the heart. 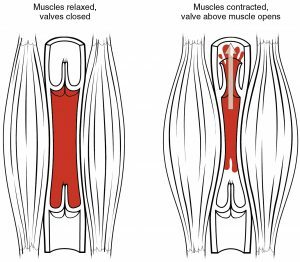 When muscles (such as the quadriceps) contract (during walking, running etc), the valves are forced open to increase the venous return. Respiration – During inspiration, venous return increases as the pressure in the thoracic cavity becomes more negative. This reduced intrathoracic pressure draws more blood into the right atrium. Venous Compliance – Increased sympathetic activity will reduce venous compliance. This will increase the venous pressure and venous return as when flow into the veins increases, it cannot dilate to accommodate the increased blood. Instead pressure in the veins rises and blood flow through the vessels must increase to empty the veins faster. Blood Volume – The greater the blood volume in the veins, the greater the flow and the greater the venous pressure. The heart can accommodate the increased blood volume because of the Frank-Starling mechanism (the greater the stretch, the greater the contractility of the heart). The Heart – must be working efficiently to pump blood out of the veins and maintain CVP. The competency of the valves in veins in compromised. This means the valves do not sufficiently close, allowing blood in the veins to flow backward and accumulate in the veins. This can decrease the venous return. This commonly effects the superficial veins of the legs, which look engorged and twisted. Blood can pool in the veins to cause bruising and ulceration of the tissue if the pressure becomes excessive. 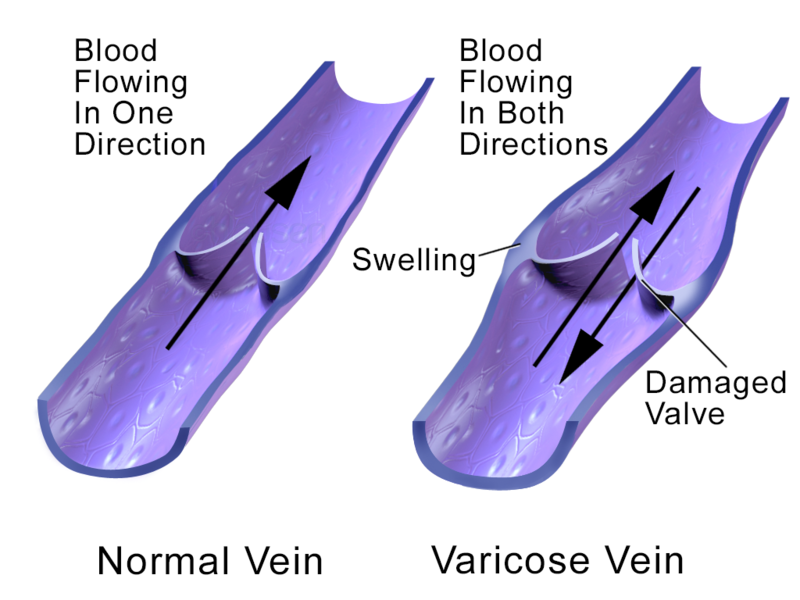 Fig 2 – Diagram showing the difference between normal veins and varicose veins. What is the driving force for filling the heart? Select the single best answer. What will be the immediate effect of raising total peripheral resistance (TPR) on venous pressure (VP)? What will be the immediate effect of raising cardiac output (CO) on venous pressure (VP)? What is meant by high capacitance with respect to veins?